Located in the Upper Silesia, a heavily industrialized region of southern Poland, Katowice is often overlooked as a tourist destination. Having developed on the coal mining and steel industry and having suffered destruction during WW2, Katowice has a limited historic and cultural heritage, compared to other popular tourists spots in Poland and especially to Krakow, located just 50 miles away. This fairly young city does make up for the shortage of historic monuments with an offer of modern attractions, a vibrant cultural/music scene and many commodities. Katowice is also conveniently located near major highways which allow access to major cities in Poland, as well as in Slovakia, Czech Republic and Germany. The city is located in the continental-temperate climate zone. The weather in Katowice is determined by the geographic location, namely the distance from large bodies of water and the existence of the mountain pass, the so called Moravian Gate, between the Sudeten and the Carpathian mountains which allows passage of different air masses. Generally, the climate of Katowice is characterised by fairly mild temperatures both in the winter and summer, with an average yearly temperature of 8.5 degrees Celsius. The ‘human element’, that is a presence of a large population (around 2.7 million in Katowice urban area) as well as the heat-generating heavy industries play into the weather conditions, making the city centre usually slightly warmer than the suburbs. 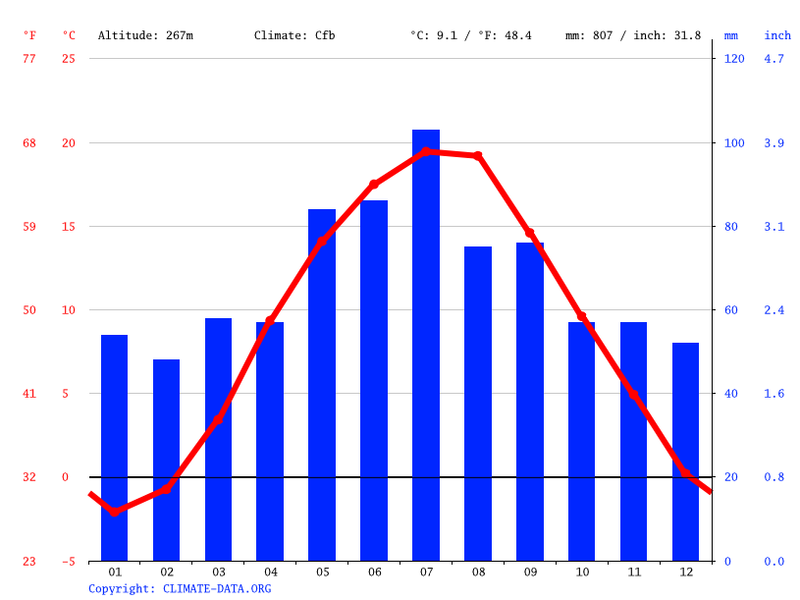 The summers in Katowice are warm, but rarely excessively hot. The average daytime temperatures range from 20 to 23 between June and August and thermometers rarely eve indicate 30 degrees. Rain is quite common in Katowice throughout the whole year but the most precipitation (in terms of volume) is registered in June and July. Early autumn is a great time to be in Poland in general, due to the beautiful spectacle of the trees changing colours and Katowice is no exception. The ‘Polish Golden Autumn’, as this season is often referred to in Poland, can be admired in many of the city’s parks and green areas. The average daytime temperatures of 14 degrees Celsius in September drop quite abruptly to around 4 degrees in November, anticipating the winter to come. While Autumn is usually associated with rain, October is actually one of the driest months in Katowice in terms of rainy days per month. Daytime temperatures below zero can be felt in Katowice from December to February, but usually at only about -1.5 - -0.5 degrees Celsius. Although the lowest temperature ever registered in Katowice was -27.4 °C, the winters here are in general mild and marked by cloudy, somewhat gloomy days. Snow is quite frequent during that time but like in other major cities, the snow cover does not last. Spring arrives late to Katowice. March is still fairly chilly, with average daytime temperatures of around 4 degrees Celsius. The significant increase of the temperatures can be felt only in May, when on sunny days the thermometers will sometimes indicate 20°C. Be prepared though for the rain as in May there are, on average, 17 rainy days. Does it snow in Katowice? Spring weather Silesia.